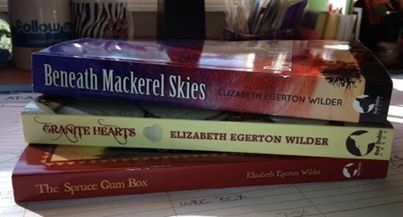 Elizabeth Egerton Wilder (aka Betty) is a senior-aged writer who finally realized her heart dream of publishing a novel on her seventy-second birthday. Married fifty-eight years (yes, to the same man), her stories are colored by family tales, life experience and tons of research. Mother of three and grandmother to four, she had dabbled in the writing craft to fine-tune her dream. While raising her family, she taught kindergarten, worked in myriad offices, earned a BA in Art and Education, worked as a watercolorist and photographer along the coast of Maine, became a needle-arts designer for a national producer of kits, worked as a colorist, and was a shop owner. 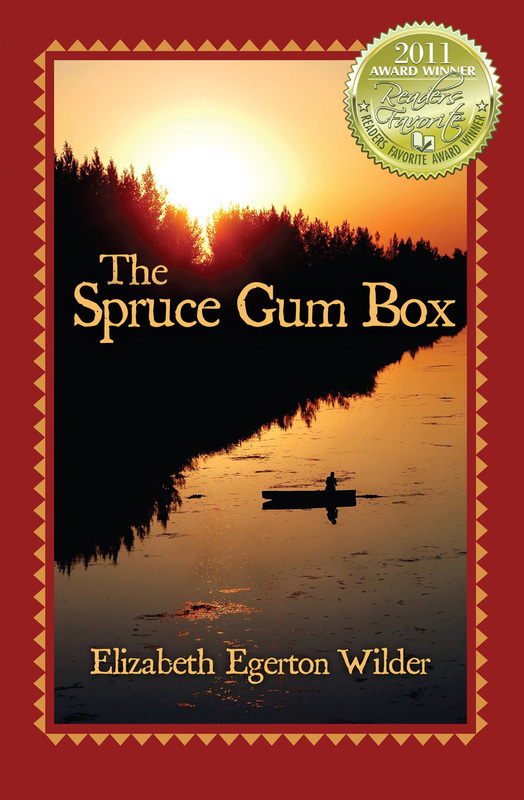 All these skills, combined with her innate love of nature, led to her novel, The Spruce Gum Box. This was followed by Granite Hearts, and Beneath Mackerel Skies, all of which are northern Maine historical fiction novels set it the mid 1800’s. Travelling through the publishing maze, is Tea Leaf Annie – a memoir of a young girl (Betty Anne) during the 1940’s. Now, at seventy-nine, her WIP is a historical fiction novel focused on a women’s rights activist in Boston, early 1900’s. She hopes not to run out of time before ideas. Please visit her web site at MaineAtHeartBooks.com. With a bounty on his head and his infant son hidden beneath his coat, Jed turned to the only man he felt he could trust—the leader of a nearby Micmac Indian settlement. The unlikely partnership that ensued defied all odds, overcoming bigotry, betrayal, and the unforgiving 1820s Maine wilderness, to stake a claim on the primitive New England landscape. Wholesale through Ingram, Baker and Taylor, and publisher direct. Discounts given to qualified book clubs. In Granite Hearts, sequel to The Spruce Gum Box, Sean and Gert Ryan set forth from the familiar comfort of their Aroostook River homeland in Maine to begin life anew along the Penobscot. Naïve newlyweds, wide-eyed with fanciful future hopes and dreams, they leave tranquil Smytheville to settle near bustling Bangor, the mid 1800’s lumber capital of the world. In time their bright future faces clouds of uncertainty. Nana Hodge embraces the couple with her sheltering wisdom but can’t protect the growing family from escalating bigotry and impending tragedy. Sean’s Micmac Indian roots spawn dangerous conflicts on the jobsite of Fort Knox being built to protect Bangor from possible British re-occupation. Though Gert raises their family to respect others, many choose not to return that respect. Despite this, she grows strong fighting injustice towards the Penobscot Indian Nation, treading the dangerous shadows of the Underground Railroad, while growing as a woman within the suffragette movement. Unfortunately, Sean’s quest to provide the best for his family ultimately leads to their neglect and eventually strains the marriage. As his personal troubles devour him, Sean and Gert’s union begins to fracture, not having the strength of the beloved granite which he chisels at the Fort. In time, their two eldest sons leave home to fight alongside Joshua Chamberlain and the Maine 20th in the War Between the States. And thus, the Ryan family must endure even more sacrifice. Mackerel Sky, Mackerel Sky, Never long wet, Never long dry. The American Civil Warm may have ended but the tragic loss of one of the Ryan boys still holds heavy in the hearts of his family. Little Cece, born after her big brothers went to war, is a wise and knowing child who adds just the bit of glue her family needs to bind them during the hustle and bustle of rapid growth along the Penobscot River in Maine where bigotry towards native Americans continues to run just beneath the surface of everyday life. Twins, new immigrants from London, bring surprises that turn the static life at Prospect Ferry into unexpected mayhem. Romance, jealousy, brutality, fears, joy and despair mix to affect the family from Fort Knox to Indian Island to Aroostook County. If one dared ask, "What's next?" Cece would reply, "I not know." Order the "Maine at Heart trilogy" as a signed trilogy below.